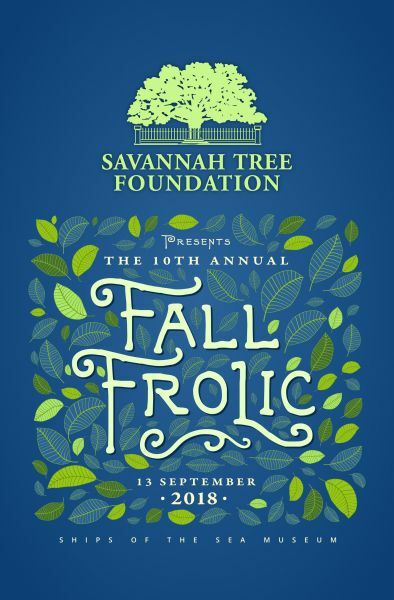 Savannah Tree Foundation's 10th Annual Fall Frolic | CitySpin Savannah Your Ticket to Savannah Events! Join us for our annual celebration of trees! Live music, open bar, heavy hors d’oeuvres, silent auction, museum tours, trees (of course), and more! Grab your friends and join the party as we celebrate Savannah Tree Foundation’s commitment to preserving, protecting, and planting trees across Chatham County. The 10th Annual Fall Frolic features heavy hors d'oeuvres by Delightful Catering, full open bar, and Ships of the Sea Museum tours. Enter the Giving Tree Raffle, enjoy live music from Connellis, and bid on silent auction items like an Oyster Roast for 20 in Bluffton, an all-inclusive vacation on Little Saint Simon's Island, Candler Oak seedlings, jewelry, festival passes, and more!